Lions are ever present throughout the novels of Wilbur Smith. The ‘King of the Beasts’ has from ancient times been used in language and culture as a symbol of nobility, strength, power and courage. They say that even the bravest hunter is frightened three times by the lion. Once when he sees its tracks, twice when he hears its voice, and the third time when he confronts the beast face to face. Lions are ever present throughout the novels of Wilbur Smith. A Courtney's first encounter with a lion occurs in Birds of Prey when Hal Courtney and his companions are crossing the southern cape from Cape Town to Elephant Lagoon (Knysna). The ‘King of the Beasts’ has from ancient times been acclaimed in language and culture as a symbol of nobility, strength, power and courage, adopted by royalty to signify majesty and by sportsmen to convey ferocity. The lion (from the Latin 'leo') is the second largest of the big cats, the first being the tiger. The average lion grows to roughly four feet in height and between five and seven feet in length, weighing between 300 and 500 lbs. Colours vary in shades of tawny yellow, from a light buff to a reddish brown. The male lion's thick mane is unique amongst the big cats and makes the lion appear even larger and more intimidating, undoubtedly contributing to the animal's majestic image. The mane is a good indicator of a lion's age, too, since as he grows older his mane becomes darker. In the wild, lions live to between twelve and fifteen years old, in captivity they have been known to live to over twenty. Contrary to the popular saying, the ‘King of the Jungle’ doesn't actually live in the jungle, instead preferring savannahs and grasslands. Unlike most cats, lions are sociable and live together in prides, usually made up of eight to ten females and their cubs, and two or three related males. Lions usually have a litter of two or three cubs, with all the females in a pride giving birth at the same time, so that they can all help with raising the cubs. When a new male deposes the incumbent male of the pride, he will often kill his predecessor's cubs, so that the females can provide him with his own young. Young males who survive will eventually leave the pride and live alone for a while, until they have reached the age of four or five, when they are ready to challenge other males for leadership of their own pride. "Amber froze. Tadesse was pointing down and to her right. At once she heard a low snarling growl and turned. It was a lioness, less than ten feet away, her ears back, her lips pulled back from her three-inch fangs, head down and shoulders raised, ready to spring forward. Time stopped as the great beast made her leap, a blur of movement, tawny hide, muscle and light, and the ﬂash of those terrible yellow eyes." Female lions do most of the hunting, whilst the males defend the pride and their territory, which may extend up to 100 square miles. Typically, Lions will hunt at night when it is cooler. They work together as a group, fanning out in a broad semicircle as they make a stealthy approach towards their prey. Once in position, the lions mark down their prey, then race into the startled pack and leap on their chosen target before it can run away. Surprise is essential because many animals can run faster than a lion and they do not have a lot of stamina. Indeed, they like to conserve their energy by resting or sleeping for up to twenty hours a day. Lions prefer to prey on medium-sized animals, such as wildebeest, zebras and larger antelope, as well as young elephants, giraffes and buffaloes. They are also quite happy to scavenge and purloin the kills of other animals, such as hyenas and cheetahs. Where once they roamed throughout Europe and Asia from Greece to India, today the lion is found almost exclusively in sub-Saharan Africa, with only a few hundred Asian lions surviving in India in the Gir National Park and Wildlife Sanctuary, which was specially created to protect them. 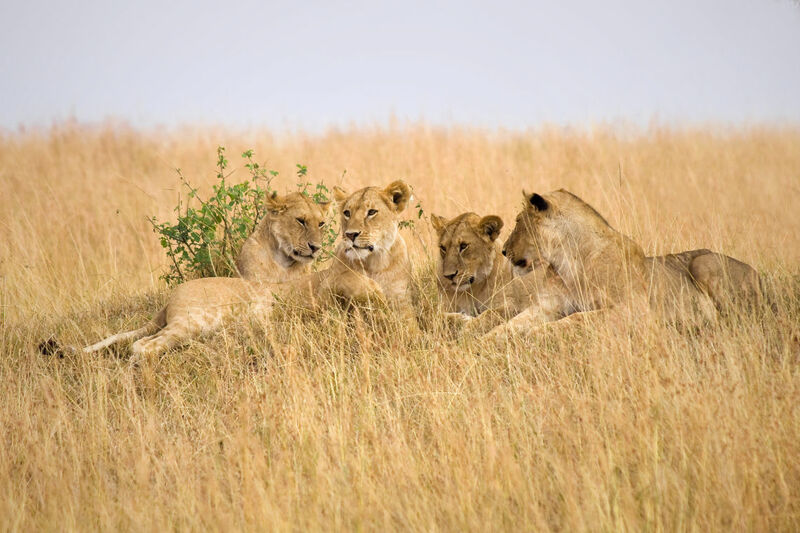 Lions now mostly live in the game reserves and national parks of eastern and southern Africa, particularly the Samburu National Reserve in Kenya, the Serengeti National Park in Tanzania and the Kruger National Park in South Africa. At the end of the 19th century, there were estimated to be over one million lions in the wild in Africa. Today that figure is between 20,000 and 40,000, and the lion is now viewed as a 'vulnerable' species. For centuries, lions had been hunted by native Africans and by farmers protecting their livestock. The sharp decline in the lion population over the last 150 years or so is partly due to loss of habitat to agriculture, mining and urbanisation, and partly to excessive poaching.